Well, this morning I am sure there are still a few full tummies in this town. 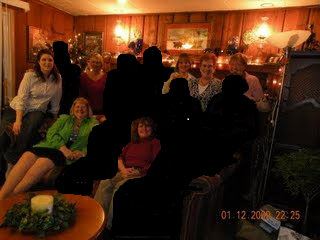 As I mentioned yesterday, The Stitching Sisters were gathering at one of the nicest resturants in town and it has been requested that we continue on this tradition for 2013.
we missed each and every one of you and hope you had a nice very evening. ok, now on with the story. and in a very short time everyone attending was present and accounted for. We all agreed that it was so nice to have the back room. For one thing it was warm, unlike the being near the front door, it was also a tad seculeded (an added advantage for the other celebrating patrons) and nicely decorated for the Christmas holidays. Emily was our server and an amazing one at that, she didn't miss a trick and a very friendly young lady. There was enough "Spirit" at that table for the entire evening and well, we certainly did not fall short on the laughter! Who Knew?. Then came the actual dinners... Holy Bunkum Batman, were those plates full. Each and every platefull looked just scrumptious, and from where I sat, it looked like everyone was totally enjoying their choice. The pure pleasure of getting together for Christmas Dinner and having someone do all of the preperations, cooking, tidying up and basically waiting on us for every little detail was simply wonderfull. Be still my jealous heart :) But really, so glad that you had such a nice time...this has been a trying year @The Landing and a night surrounded by sisters was just what was needed. They say it only takes a loving heart to be the heart of any group, and I think you fit that bill, dear friend. 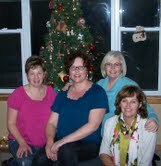 Wow - Jayne you are so blessed to have your Stitching Sisters. The celebration had FUN written all over it! Now, to make sure your exchanges are all fini before next week. I know those smiling faces!!! What great pictures :-) Thrilled to hear that you had such a wonderful time!! Looks like a good time was had by all! Our group still does the potluck party and I'm sad to say I'll be missing it this year. My stitching sisters know how to warm the heart like no others! Looks like yours do too. I have nominated you for the Liebster Award. Congratulations! If you have any questions on how this works you can go to my blog. It would be nice to have so many stitching friends so close by to get together on such a regular basis! How fun.